LED lights use isolated power supply to ensure safety. They are highly efficient and reliable. Compared to traditional fluorescent lamps, LED lamps can save at least 70% of electricity at comparable illumination level. Instant start and no flicker, protect human eyes. LED fluorescent lamp is easy to install, can be applied to traditional fluorescent lamp bracket, direct replacement of traditional fluorescent lamp (no starter needed), reduce the cost. LED fluorescent lamps are particularly suitable for shopping malls, factories, car parks, schools, office buildings, hospitals and indoor lighting. Full brightness when movement detected, dropping to 25% (4.5W) brightness in standby mode (no movement). Built-in microwave or PIR motion sensor. Replace tubes in existing fittings easily. The T8 LED Tube fits into your exiting fluorescent T8 light fixtures. Sensor is located inside each T8 LED tubes. LED tubes stay on when motion is detected, goes to standby mode (25% brightness) after 30 seconds if no movement is detected. 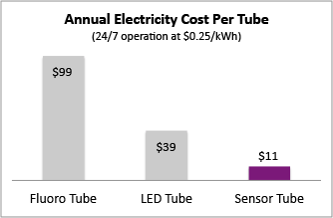 Compared to conventional fluorescent tubes, the T8 LED Tube with microwave motion sensor saves nearly 89% of energy. It works in all fitting types, including those with diffusers! T8 Fluorescent tube (36W) plus ballast (9W). Total = 1.08 KWh/day. T8 LED tube 18W (eg. 1 hour per day) and 4.5W in standby. Total = 0.12 KWh/day. That’s an 89% energy saving! Environmental Friendly: no UV nor infrared radiation, no heat, no mercury leakage risk.